By now, many of you will have noticed that since returning from my summer holiday in Asia, I have been visiting Pan-Asian and East-Asian restaurants far more frequently than I did before. Though I wish I could say that this was due to some sort of cultural awakening on my part, the truth is that I just really miss authentic Asian food. And, given that London won’t be turning into a tropical island anytime soon, (unless Donald Trump’s hair spontaneously combusts and accelerates global warming), a selection of good Pan-Asian restaurants is probably the only thing that will alleviate my holiday-blues. Tucked away on the relatively quiet James Street, Cocochan is undoubtedly overqualified for this list. 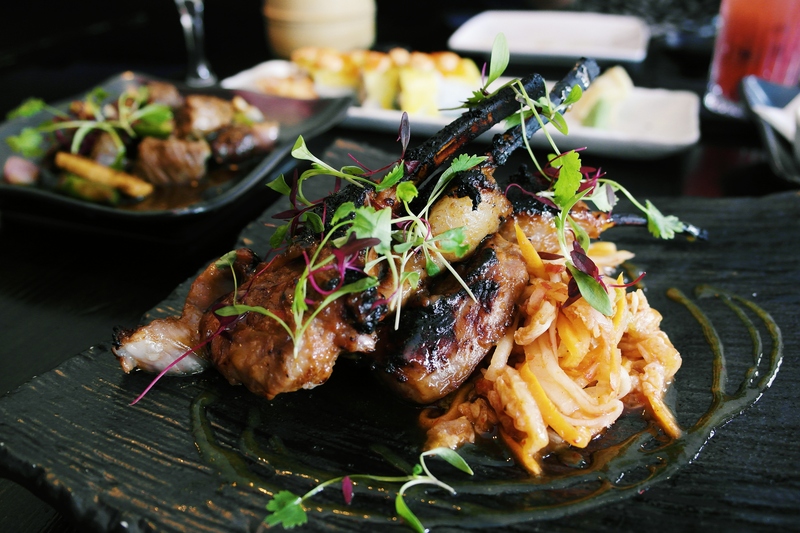 Consistently regarded as one of London’s best Pan-Asian restaurants, (with several awards to prove it), Cocochan has remained at the forefront of London’s undying love for Asian cuisine. 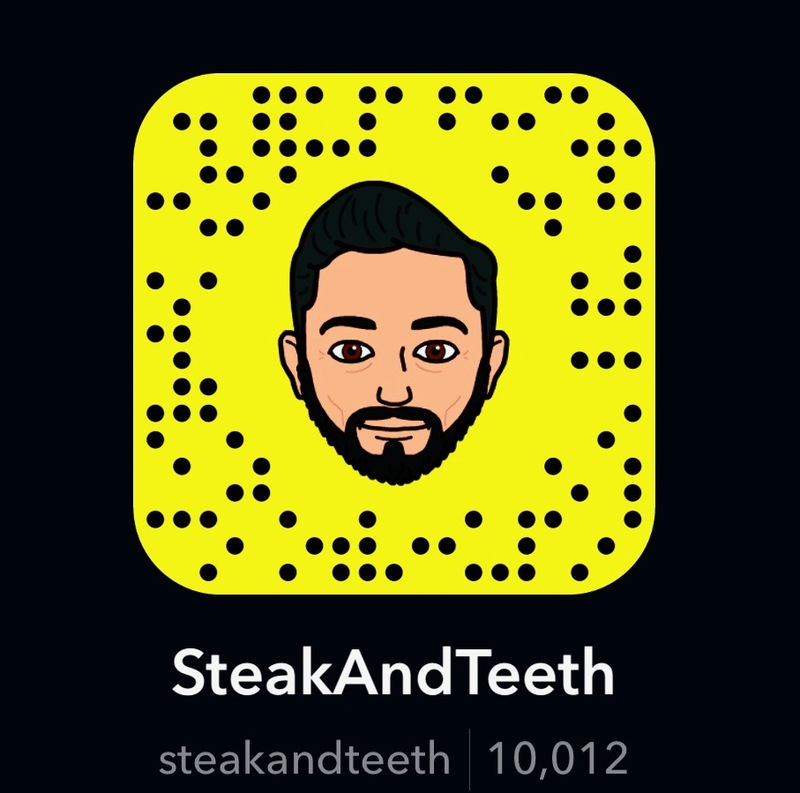 Naturally, Steak and I needed any half-baked, insignificant excuse to pay them a visit, and although my birthday could be considered more of a “quarter-baked” excuse, we decided that it would just about do. 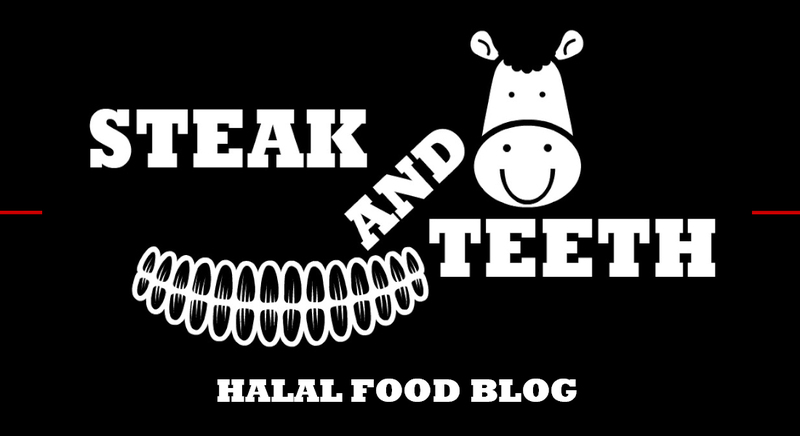 Note: Only the chicken, lamb and beef served here are certified halal. Alcohol is served on the premises. 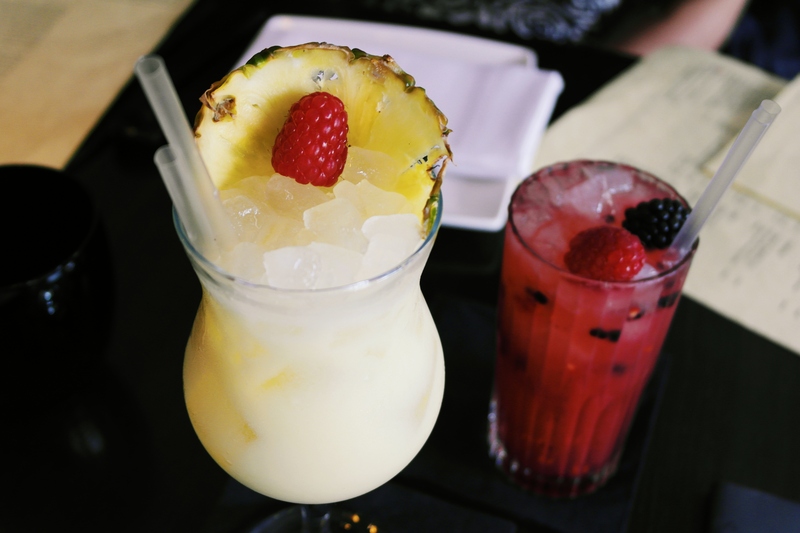 As we examined the menu, Steak and I ordered a pair of mixed berry and pina colada mocktails to whet our appetites. Surprisingly, my pina colada possessed a very sour character with very little sweetness, owing to the dominant pineapple juice, which seemed to overwhelm the coconut cream. By contrast, the mixed berry was sweet and refreshing, but neither mocktail left a lasting impression. Thankfully, the food itself turned the show right around. 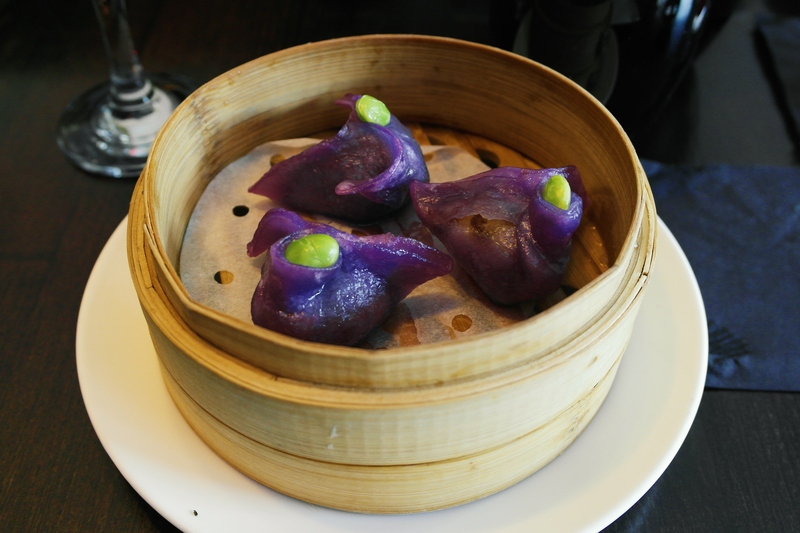 First to arrive were the XO prawn dumplings, which were soft, sticky and so vibrantly purple that you’d be forgiven for asking whether they were steamed in a radioactive substance. Thankfully, the only health hazard to be found here is an overdose of the tender, flavoursome prawns to be found within. Little did we know however, that the prawn tempura would completely overshadow the dumplings. 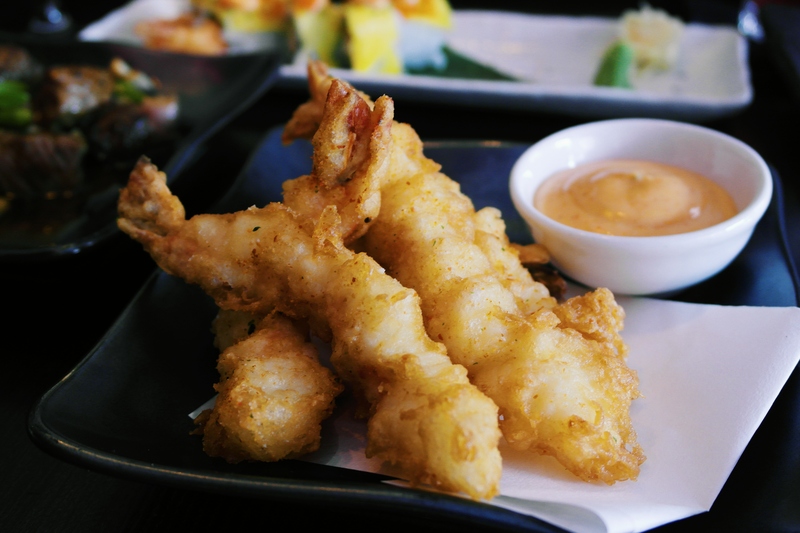 Composed of thick, succulent prawn in a wonderfully crispy batter, the tempura delivered a most satisfying combination of soft and crunchy textures. This was soon followed by the sharp kick of the batter seasoning, which cut through the tempura, and contrasted with the thick and creamy spicy mayonnaise. 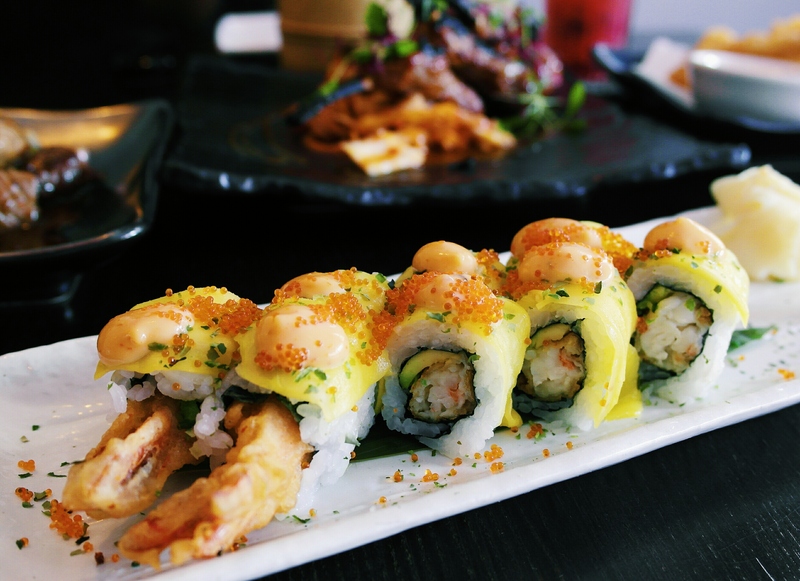 As we began to enter a state of prawn-induced euphoria, the tempura maki rolls threw themselves onto our tastebuds, (honestly, we have no idea how they got there), and tipped us right over the edge. The crispy tempura pieces contrasted with the soft, sticky rice, the juicy mango slices and the creamy spicy mayo, and delivered a fantastic range of addictive textures and flavours. With our starters well and truly devoured, I moved on to the wok-grilled beef sirloin. Though it was cooked to a perfect medium, (and very tender as a result), the beef was somewhat under-seasoned. Thankfully however, the rich umami flavours within the black pepper sauce and the occasional kick from the red onions and spiced vegetables did well to satisfy the palate. As I made my way through the beef, I kept a firm eye on Steak’s kimchee lamb cutlets and waited to hear the magical words – “I’m full”. The cutlets, though cooked to well-done, remained exceptionally tender, and carried a plentiful amount of seasoning. Each cutlet possessed a pleasant tang and a deep, rich, aromatic flavour, which swelled with each bite of meat, rising up to roof of the mouth and tickling the senses. Together with the sharp and crunchy kimchee accompaniment, these succulent cutlets proved to be utterly fantastic. As our stomachs began to rip the very fabric of space and time itself, we filled what little space they did have left with Cocochan’s salted caramel mousse. 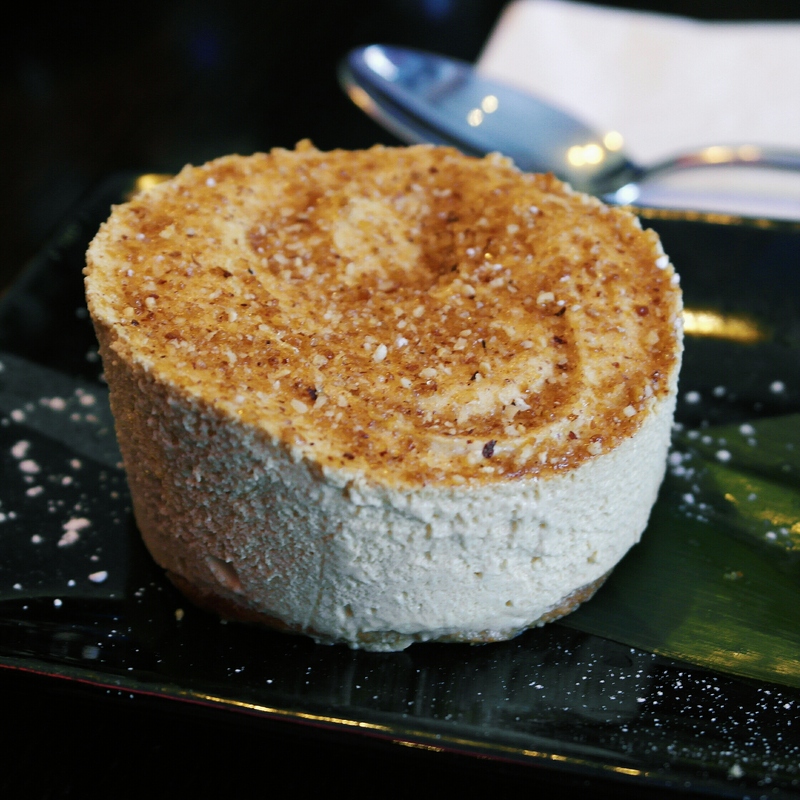 Served with a scoop of rich vanilla ice cream, the mousse was both light and creamy in its consistency, with a thick, cake-like base that provided both texture and body. Whilst I felt that the mousse needed to be a touch richer, Steak thought that its subtle flavours were well-balanced, and promptly hoovered it up. Of the items we sampled, the XO prawn dumplings cost £6, whilst the prawn tempura and tempura maki rolls cost £11 and £14 respectively. The wok-grilled beef meanwhile, cost £18, the kimchee lamb cutlets cost £20, and the salted caramel mousse came in at £6. Together with our mocktails, (£5.50 each), a portion of egg-fried rice (£4), and the service charge, this amounted to a total bill of £101. Across the rest of the menu, starters, dim sum, and sushi range from £5 to £14, main courses range between £13 and £33, and desserts cost around £6. As such, a meal at Cocochan can certainly become rather costly rather quickly, and you should be prepared to pay a rather tidy sum. Relative to the location and the calibre of the food however, we think it’s a fairly reasonable fee to pay. As one would expect, the service at Cocochan is fine-tuned towards warmth and hospitality. Staff members are both welcoming and attentive, and are more than willing to accommodate your requests. If it’s your birthday and your friends decide to get you a big cake, you may even be fortunate enough to be sung to by the head chef – though I didn’t have the pleasure. Perhaps because we didn’t make it obvious that it was my birthday, or perhaps because he saw my face and thought “No way should we be celebrating the birth of that”. Equally endearing is the versatile and attractive layout of the restaurant, which is spread over three unique dining areas – Purple Dokoro, White Dokoro, and Gold Dokoro. Each area hosts a modern and stylish decor, and the mixture of dark wood, rich purple velvet, and crisp white paint in the Purple Dokoro – (where we dined), carried a certain sense of warmth and comfort. The dining areas can also be reserved or joined together for special events and occasions, which, (though useless for me), would no doubt come in handy for people with friends. Cocochan can be found a quick five minute walk away from Bond Street station, and public transport is certainly advised. However, despite the amicable service and the chic surroundings, the ambience within Cocochan can, at times, be a little dreary. That said, the dining experience as a whole remains comfortable and cordial, making Cocochan a suitable destination for any occasion. When I think of a Pan-Asian restaurant, I often picture a chef on a unicycle juggling a variety of sharp knives, scalding pans and slippery ingredients. At some point, something is bound to go wrong, and certain dishes and sub-cuisines are bound to thrive at the expense of others. 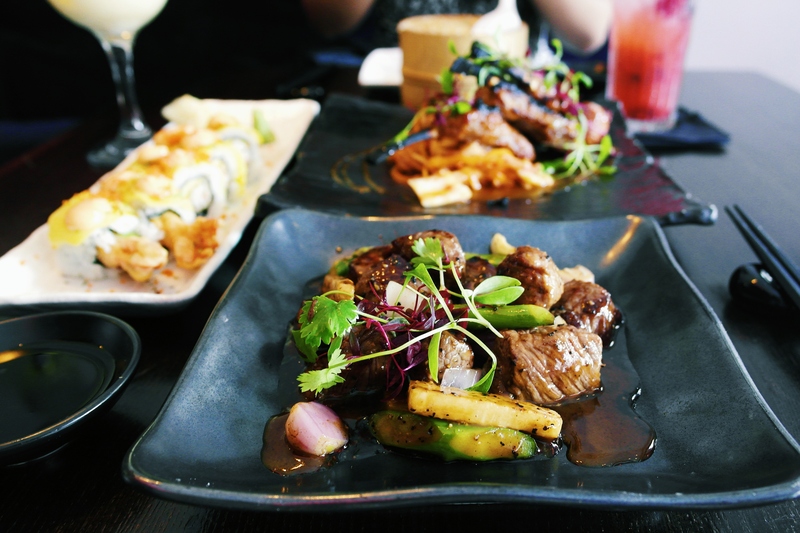 Whilst this is certainly the case at most Pan-Asian restaurants, Cocochan is one of the few that manages to do justice to the very concept of Pan-Asian cuisine itself. Sure, some of the dishes we sampled weren’t without their faults, but such faults were minor at best, and the unique blend of flavours and textures on offer culminated into a truly memorable and fulfilling meal. 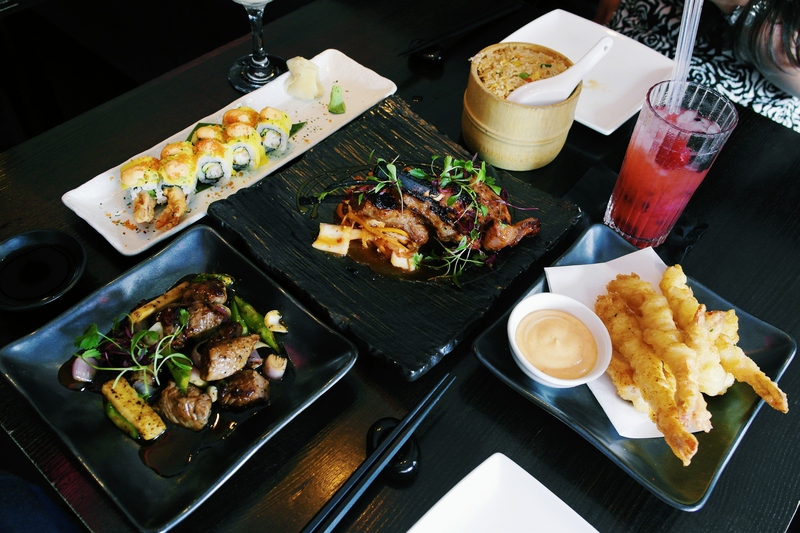 Whether or not it is indeed “the best Pan-Asian restaurant in London” remains to be seen, but we can certainly say that our meal at Cocochan was one of the finest Pan-Asian experiences we’ve had thus far. Whether it’s a casual indulgence or a special splurge, this is one illustrious establishment that may just be worth the damage to your bank account.